The Fall 2018 RASE cohort is currently full. Students in this fee-based, elective program are assigned a transition coach to work with them, one-on-one, for up to 5 hours per week. 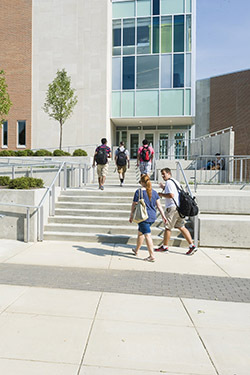 The transition coaches are experienced undergraduate or graduate students who are available as a resource for students on the Autism Spectrum. Employees of ODS, coaches set their schedule to accommodate their students’ specific needs. Coaches work with students on transition competency areas to develop the structure and framework necessary to be successful in college. The coach’s focus can include assisting the student with learning self-advocacy skills, accessing campus resources and services, and problem-solving. For more information about the Transition Coach program, including eligibility requirements, please see the RASE program brochure (PDF). • Starting in Fall 2019 the RASE program cost will be $750 per semester for year one and $300 per semester for additional years. Should you have quesitons about the RASE Transition Coach Program, please the RASE coordinator, Heather Rando. When I first entered college, I was not very well prepared. The challenges I ran into might have overwhelmed me if my transition coach hadn't been there to help. She assisted me though my experience, helping me to get my priorities straight, as well as remind me that I might not always do perfect and that it's OK. The support group helped me simply by reminding me that I'm not an alien, and that there are others with similar problems. By M.H., second year student who participated in RASE his freshman year. “If you’re willing to put in the work here, everyone is going to know your name and you’re going to be able to succeed." Read more about Mitchell in his feature Quantum Leap in the Wright State Newsroom. Facilitated by Counseling and Wellness Services, the Students on the Spectrum group provides a supportive environment for students diagnosed with Autism Spectrum Disorder to share their personal experiences, develop allies, and receive feedback. This group will address issues that are important to members in an effort to enhance overall adjustment to college life. For more information about the support group and for upcoming meeting dates/times, please contact Counseling and Wellness Services at (937) 775-3407.